Batman is back, bigger and better than ever with this new online slot game, but does The Dark Knight pay homage to the movie, and why is it one of the most popular games on the net? The Dark Knight slots is a franchised and licensed progressive jackpot slot game by online casino slot kings Microgaming. The theme of The Dark Knight Slots naturally takes it shape from the hit blockbuster Batman movie of the same name, which has proven to be a real crowd pleaser in those terms. The slot contains five reels and upon them are sat two hundred and forty one pay lines, one of the highest figures you will find in the online slot world. This progressive jackpot slot has a total of 30,000 coins to offer one lucky winner, and that is the bare minimum the jackpot can be; it can only rise higher. 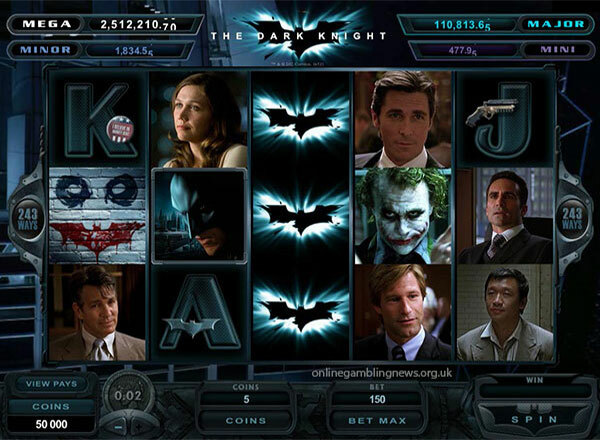 Some of the most common icons from the movies are portrayed in The Dark Knight Slot game, including the Joker, the Batman logo and the Joker’s logo symbol. The Batman logo mixed with the Joker’s face paint creates the game’s scatter symbol and the wild card used in this game is a stacked wild. Whilst The Dark Knight Slots contains wild cards and scatter symbols, it is missing multipliers. This absence is rectified by the inclusion of a free spins feature and of course the customary Microgaming bonus game. Playing The Dark Knight slot is relatively cheap. The Dark Knight Slots can be played from as little as 0.30 per spin, up to a still bizarrely cheap 6.00 per spin. For a progressive jackpot slot game, that is positively cheap! The Dark Knight slots is a nice take on the Batman story, and unlike many other franchised games, this game offers something new, rather than just a re-hash of already existing slots. The Dark Knight Slot will provide hours of entertainment to online slot fans whether or not they are in love with the Batman franchise or not.